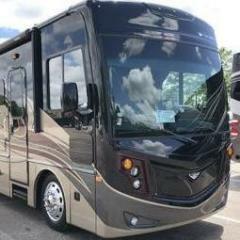 We recently purchased a 2015 Newmar Ventana LE. I was dissappointed the in dash stereo, does not have GPS or Bluetooth. I have read the forum, and do not see anyone identifying a good solution for all three. We would like the GPS to be able to input our size and weight to avoid those frustrating turnarounds at low crossings. Is there such a unit? I would prefer not to add an additional screen to the dash or a sit on top of dash, if possible. Check with the steoeo installation companies in your area. I had mine replaced with one that included blue tooth and xm radio on my old motorhome. They should be able to tell you. Check on the rand mcnally website. Jaime. Nice ride! You a photographer or gun smith? I know a Jamie in DP. The main reason for choosing a stand alone GPS was that I wanted the ability to replace the GPS at a later date without having to replace the stereo with it. GPS technology seems to change and update much faster than for car stereos. The Garmin unit has the built-in RV features you're looking for - it's set up so that you enter the profile for your rig (weight, length, height, etc) and it programs routes for you with those factors in mind. I could not find a combined stereo/GPS unit that could do that. Carl, Jaime is the Photographer for Six-State and does a fine job. His first Rally pictures can be seen at sca-fmca.com. He has daily pictures of the Rally. I would not buy another Rand McNally product other than a map certainly not a GPS! The one I have is about 3 years old and unfriendly to use, buy a Garmin! Find one that you can speak to...like your phone...I am going to look and then hit this Rand McNally with a axe, besides the battery has never been good, short life. Herman. Yes, via PM, I now know that. There is another Jaime in DP that is a Gun Smith, we played tag at the 2016 Six State in Shawnee, OK. My cost $7,200+ ! 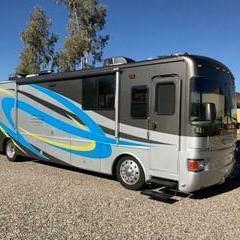 I have one that came with this coach, everything you want and more. First thing I did, was to disable the GPS...POS and took me to places I did not want to go, including a Farmers field in AZ., I had to be towed out. Get a stand alone Garmin or a old fashion MAP ! I would get both. In my car I paid about $1500 for the extra 'value' package to get the GPS built into the touch-screen media center. It was came with marginally ok maps and features. Problem was that the maps were only updated every 18 months or so, and that just wasn't going to work. The roads around here are in a constant state of construction and the 18-month update cycle caused the unit to send me to freeway ramps that no longer existed, roads that had long-ago been moved, and other problem areas. I ended up adding a Garmin to the car which gets new updates every few months. Same thing on our coach. I take the Garmin into the house every month and check for updates. If you do end up getting a combined unit, be sure to check the frequency and availability of map updates. Last couple of years we've been using our cell phones. It gives us instant information on traffic conditions, I don't know how it does it but it does.